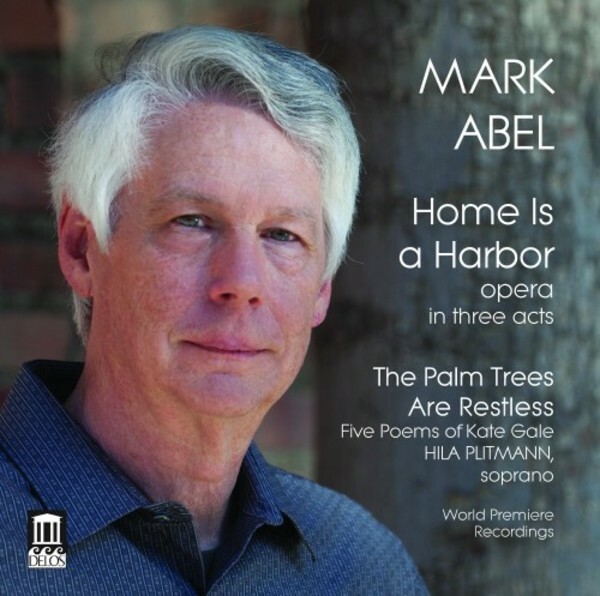 Such words could also describe this stunning new release: Home is a Harbor, Mark’s first opera. And a wondrous bonus in this two-disc set is his latest song cycle, The Palm Trees are Restless (Five Poems of Kate Gale). Both works are prime examples of Abel’s hard-hitting signature style that couches often biting social commentary in a unique musical fusion that combines the depth and sophistication of classical music with the in-your-face impact of rock. Many of the wonderful singers who graced his previous releases are also members of Home Is a Harbor’s marvelous cast. Palm Trees gets a superlative performance from Grammy-winning soprano Hila Plitmann, known for her work with top contemporary composers, including her husband, Eric Whitacre. Since a veteran of the Afghanistan war is a key character in the opera’s story, Delos will donate a portion of album sales revenue to Veterans’ organizations, beginning with Cathay Post No.384 of the American Legion.